Heart of the Ironbridge Gorge. 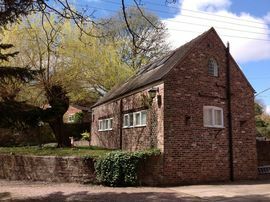 Our lovely home is set in attractive, tranquil private gardens close to the River Severn. 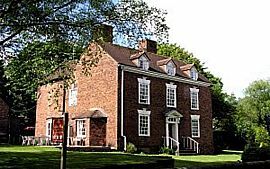 It's ideal for visiting the museums, as well as Shropshire which is so full of wonderful attractions, stunning landscapes, history and heritage. 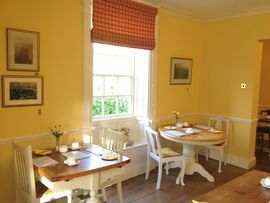 Beautiful period rooms with four poster beds along with comfortable ground floor accommodation in our coach house annexe. Double rooms from £55.00 - £90.00. This price is per room per night and inclusive of English Breakfast. Pet Facilities: Pets are allowed. Special Diets Provision: Special diets are catered for. Vegetarian. Disabled Facilities: There are disabled facilities. Gound floor rooms available. 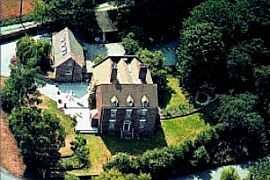 "Excellent hosts, Ironbridge was all we expected & Calcutts House a bonus!" "We arrived as guests - felt like we left as friends"
"It was horrible ......... to leave!!! 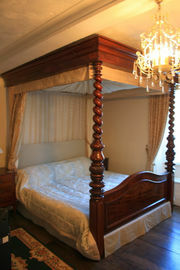 Super comfy room & 4 poster bed." "Great stay, great company and great breakfasts - we'll be back"
"Excellent stay, attentive welcome, ideal location - congratulations"
"Lovely guest house, lovely service, so very friendly and welcoming - thank you"
"Beautiful house and wonderful room - thank you very much"
"So lucky to have found you. Lovely house. Lovely people, we will return." "We did well when we stuck a pin in the accommodation guide for Ironbridge, we had a lovely stay." Leave the ring road at Castlefields roundabout, follow the B4373 to Ironbridge & Broseley. Carry on along this road until you can cross the river over the Jackfield Bridge. Carry along this road, you will pass the Black Swan pub on your right, then you will go round a sharp bend, Calcutts House is then on your right. To access our car park follow the road round to the right, you will see our entrance on your right.